By 1976, the National Front had become the fourth largest party in Britain. In a context of national decline, racism and fears that the country was collapsing into social unrest, the Front won 19 per cent of the vote in elections in Leicester and 100,000 votes in London. In response, an anti-fascist campaign was born, which combined mass action to deprive the Front of public platforms with a mass cultural movement. 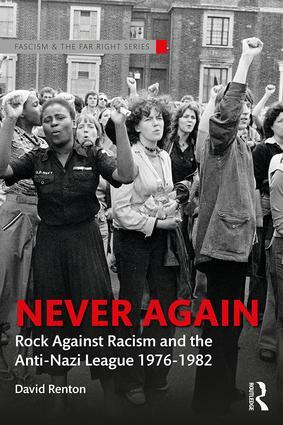 Rock Against Racism brought punk and reggae bands together as a weapon against the right. At Lewisham in August 1977, fighting between the far right and its opponents saw two hundred people arrested and fifty policemen injured. The press urged the state to ban two rival sets of dangerous extremists. But as the papers took sides, so did many others who determined to oppose the Front. Through the Anti-Nazi League hundreds of thousands of people painted out racist graffiti, distributed leaflets and persuaded those around them to vote against the right. This combined movement was one of the biggest mass campaigns that Britain has ever seen. This book tells the story of the National Front and the campaign which stopped it.